Get into the spirit of giving and celebrate the spirit of the season by adding some festive adornment to your gifts with our assorted large Christmas hessian sacks. Perfect for enclosing and holding the presents for that special someone. Our stunning festive sacks make a unique alternative to the ordinary plastic or paper bag. They are also an effortless way to inject some shine and cheer to your interior as you wait for the day of gifting. Each burlap gift bag is 50 x 70cm and is made of natural hessian material giving our large Christmas gift sacks that traditional vintage inspired look. 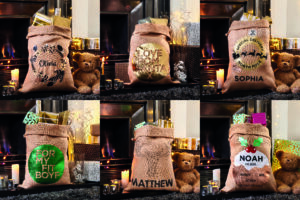 Our Christmas sacks and Santa sacks come in a variety of metallic and black colour designs some of which can be personalised. Ideal to gift to your other half, son, daughter or for a friend or relative. To find out more about our unique gift sacks and other Christmas decor and personalised Christmas gifts just click on the photo below. This entry was posted in Personalised Gifts, Festive Gifts and tagged personalised gifts, festive, Christmas, gift bags, hessian sacks, Christmas gift bag, Christmas gift sacks, Christmas gifts, unique festive gifts, festive gifts on 10th November 2017 by admin. Give your home a merry little cheer up ...let your decor & gifts be from Pushka Home. Let the Christmas spirit shine throughout your home and give a gift to be cherished this 2017 holiday season with our upcoming Christmas decorations. Here's a sneek peek just for you. 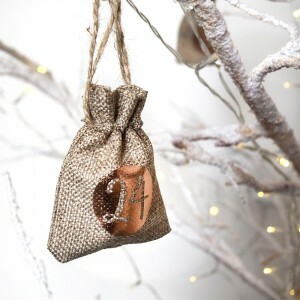 Set your sight on our wonderful new hessian gift sacks with cheerful festive metallic touches. These joyful bags will come in an assortment of personalised designs....perfect for holding all your presents for that special someone. 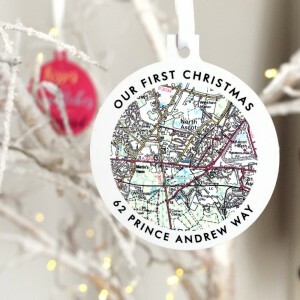 Soon to be back the Pushka signature map bauble will be available along with my first christmas photo bauble ...an ideal celebratory gift for couples, new parents and grandparents with new bundles adding extra joy to this holiday. Our baubles are ideal as stocking fillers for all the family, great as a gift to add to your special bauble collection and excellent for showcasing in your Christmas tree this year. Our hessian advent calendar sacks are making a comeback this year as one of our seasonal star sellers. They are a unique way to get your family into the Christmas spirit as well as an effortless way to add festive cheer & decor to your space. If you like what you saw visit us soon & don't miss out on our unique seasonal beauties...and just in case you weren't counting ...its only under 3 months left till Xmas! This entry was posted in Personalised Gifts, Festive Gifts, Festive Home Decor and tagged personalised gifts, festive, Christmas, hessian sacks, Christmas gift bag, Christmas gift sacks, Christmas gifts, unique festive gifts, festive gifts, baubles, advent calendar, tree decorations on 29th September 2017 by admin. In this time of gratitude and reflection (as 2016 comes to an end) we would like to take a moment to thank all our customers for all your valued support and loyalty. Thank you for choosing our brand. We hope to continue serving all of you and could not achieve our successes without you. You made 2016 a wonderful one and we look forward to showcasing new exciting items in 2017. You will find a link for a silly video from us to you. We hope you enjoy. Wishing you a very merry Christmas, a Happy New Year and a joyful holiday season. This entry was posted in Thanks and tagged festive on 22nd December 2016 by admin. Celebrate or commemorate a special moment, event or unforgettable person(s) this Christmas with our Personalised Photo Christmas Tree Bauble Decoration which is made in the UK and created by our handy elves. 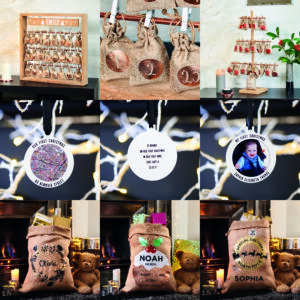 Our unique tree decoration makes a perfect and thoughtful keepsake for capturing and showcasing your memories this festive, joyous time of year with an optional message on the reverse of the decoration. Excellent for a baby's first Christmas, a newly-wed couple, a best friend or a thoughtful seasonal gift to parents, grandparents and relatives. Each decoration comes complete with a satin white ribbon and the option to personalise the other side with your own words. It is made from aluminium with a high gloss finish and supplied with a dainty white satin ribbon. Additionally, you can have the option of including a gift box with tag for the fortunate recipient. If you would like to find out more simply click on the images below and to view all of our gorgeous Christmas items simply use the link below or go to our main menu tab on our homepage and select Christmas. This entry was posted in Personalised Gifts, Home Decor, Festive Gifts, Festive Home Decor and tagged festive, unique festive gifts, festive gifts, baubles on 18th November 2016 by admin. This charming cotton Santa Sack is perfect for encasing your presents and goodies this Christmas and can be used to replace the traditional stocking. Ideal if you are travelling somewhere and need a bag to keep presents in but also a beautiful way to showcase your festive spirit and a way to bring Christmas cheer, colour and excitement into your home or someone else's. As metallic colours are very on trend as well as seasonal these are sure to suit any décor interior. 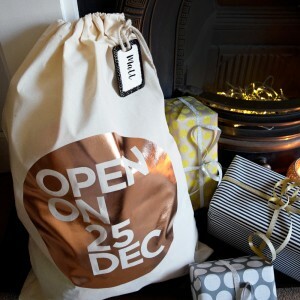 It comes with a metallic colour print of your choice on the front that reads ‘Open On 25 Dec’ and the sack has a drawstring at the top, making it easy to close (so there can be no peeking), and to hang onto the fireplace or bed post. Additionally, it also comes with an oversized name tag to ensure your presents get delivered to the lucky person they are meant for on Christmas morning. Available in a choice of gold, copper, silver, pink, green and red metallic colours and suitable for all ages. Each sack is 50 x 70cm. To find out more simply click on the image below. This entry was posted in Personalised Gifts, Festive Gifts, Festive Home Decor and tagged festive, Christmas, hessian sacks, Christmas gift bag, Christmas gift sacks, Christmas gifts, unique festive gifts, festive gifts on 11th November 2016 by admin. Make an extra special statement this Christmas to your friends, family and loved ones with these unique bauble UK map decorations which are a great way to showcase memorable locations that mean something to you and others such as where you got engaged, where you got married, where you went to university, or where you are spending your holiday. You can use them on your Christmas tree, as a stocking filler or give them as a seasonal gift. They are made to order with a UK postcode location of your choice in the centre and your choice of words at the front (around the outside of the map) or you can write a message on the back. To view more information simply click on the image below. This entry was posted in Personalised Gifts, Festive Gifts, Festive Home Decor and tagged personalised gifts, personalised, festive, unique festive gifts, festive gifts, baubles on 4th November 2016 by admin. Get your loved ones into the festive spirit with these original advent calendar tree hanging sacks which will be sure to add excitement in the countdown to Christmas. You can get as creative and personal as you like in what you fill each sack with as well as where you hang these. Why not fill these with some chocolate surprises, sweets as well as sweet messages, small toys or holiday gifts. Each sack is 7cm x 5cm and has a drawstring to ensure the contents stay inside until the day shown at the front. 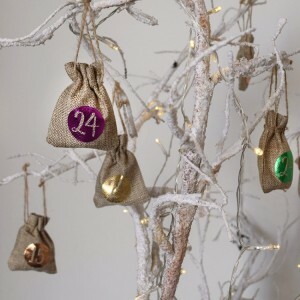 Comes as a set of 24 modern advent hessian sacks featuring eye-catching metallic numbers in the colour of your choice of gold, copper, silver, green or pink. Start a tradition that can be used again and again each year. Suitable for children or adults! To view more information on these beauties simply click on one of the images below. To view all our gorgeous Christmas gifts go to the main menu tab and click on the Christmas tab. This entry was posted in Festive Gifts, Festive Home Decor and tagged festive, Christmas, Christmas gifts, unique festive gifts, festive gifts on 28th October 2016 by admin.